One of the most beautiful of all the waxcap fungi, and now sadly quite rare in most of the countries where it is recorded, Porpolomopsis calyptriformis (until recently referred to more often by the synonym Hygrocybe calyptriformis) is found on cropped, unfertilised grassland. This waxcap appears in late summer and autumn. These lovely waxcaps generally occur as solitary specimens or in very small and scattered groups. Occasionally they can be found in churchyards, but sheep-grazed upland commons on acidic soils are usually the best places to try. Reappearing in the same places for many years the Pink Waxcap is not only uncommon but also very localised in Britain and Ireland. Because it favours unimproved acid or neutral grassland this distinctive waxcap is more often seen in western Britain and particularly in Wales, sometimes in churchyards but more often on sheep-grazed acid grassland in the hills. Hygrocybe calyptriformis occurs in parts of northern mainland Europe, where it is a very rare sight. Pink Waxcaps are sometimes found in woodlands in parts of North America. When in 1838 Miles Joseph Berkeley described this species he named it Agaricus calyptraeformis. (In the early years of fungal taxonomy most of the gilled mushrooms were included initially in the genus Agaricus!) It was the Swiss mycologist Victor Fayod (1860 - 1900) who in 1889 transferred the Pink Waxcap to its present genus, renaming it Hygrocybe calyptriformis, the name by which it was known until 2008, when Andreas Brezinsky transferred it to the genus Porpolomopsis. There are probably two British variants of this mushroom. Porpolomopsis calyptriformis var. calyptriformis is the autonomous form and Porpolomopsis calyptriformis var. 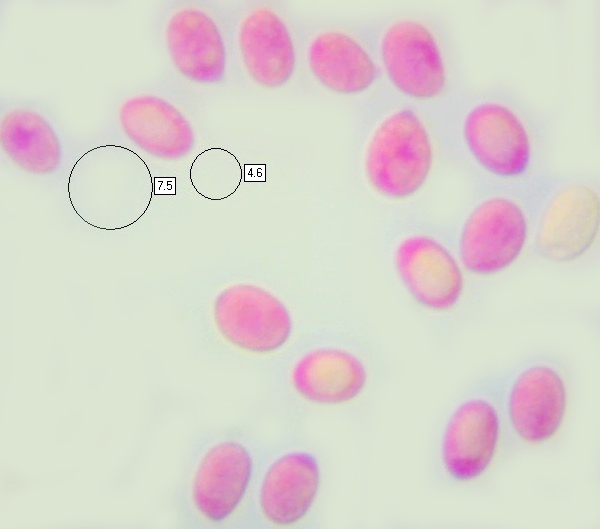 domingensis with a coloured stem, a different cap cuticle structure (at microscopic level) and spores somewhat larger than those of the nominate; however, var. domingensis has been found in Sussex, England only once, and that was some time in the 20th century; two other specimens have been recorded from the Dominican Republic and from the USA. That may seem like rather a flaky basis for defining a variant of what is already a rare mushroom. Synonyms of Porpolomopsis calyptriformis include Agaricus calyptraeformis Berk., Hygrophorus calyptriformis (Berk.) Berk. & Broome, Hygrocybe calyptriformis (Berk.) 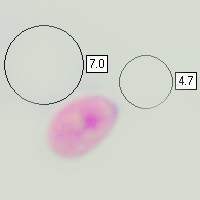 Fayod, and Humidicutis calyptriformis (Berk.) Vizzini & Ercole. The genus Hygrocybe is so named because fungi in this group are always very moist. Hygrocybe means 'watery head'. The new genus name Porpolomopsis means 'looking like a Porpoloma', the latter being a mushroom genus described by Rolf Singer in 1952. The specific epithet calyptriformis (note that the spelling has changed from calyptraeformis used by Berkeley) means in the shape of a thin hood (or cap). 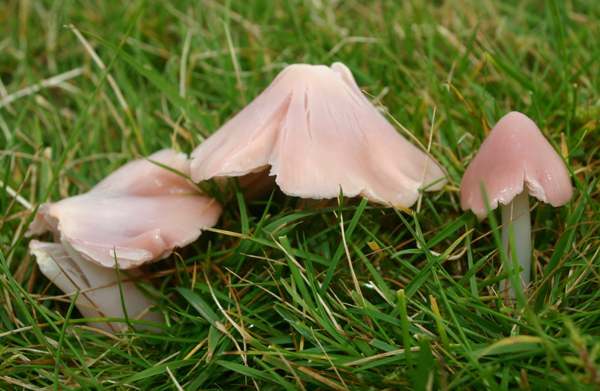 In the past the Pink Waxcap was commonly referred to as the Ballerina Waxcap, and its flared, radially-split caps certainly give it the appearance of a pirouetting ballet dancer wearing a pink tutu. 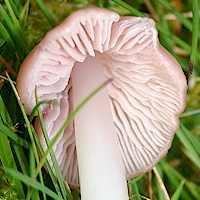 The domed cap, 2.5 to 6cm in diameter, is pale pink or lilac and at first narrowly conical; the surface is dry and silky except during or immediately after rain when it is only slightly sticky (lubricious). As it matures, the cap usually splits. The cap flesh is white but tinged pink just below the cuticle. 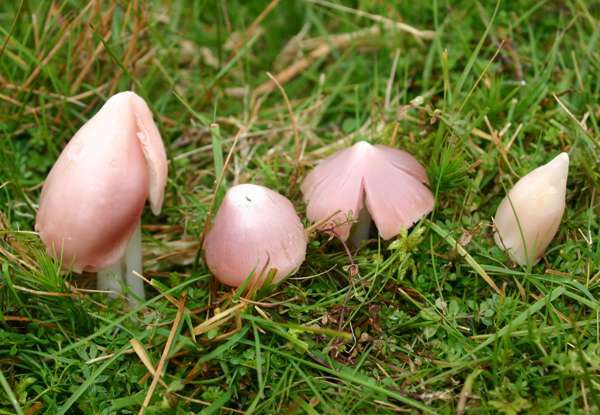 A white form of the Pink Waxcap is occasionally found and given the scientific name Hygrocybe calyptriformis f. nivea. Rose pink when young, the closely-spaced adnate gills become paler with age. White, sometimes flushed lightly with the same pink colour as the cap, especially near the apex; tending to split very easily. Level, smooth, dry; no stem ring; white stem flesh. Broadly ellipsoidal to ellipsoid-oblong, smooth; 6-9 x 4-7μm; inamyloid. Regular, with elements to 1mm or more in length. Closely cropped or mown grassland where artificial fertilisers are not spread. This is the only truly pink waxcap. Cuphophyllus virgineus is white with a broader cap. 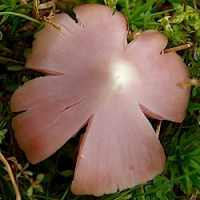 The Pink Waxcap is an infrequent to rare sight in Britain and Ireland, and it is very rare indeed on a European scale. In many countries this wild mushroom is on the Red List, meaning that it is of such serious conservation concern that it is given legal protection from disturbance by people. In 1992 the Pink Waxcap was placed on Britain's Red List, but after extensive publicity and detailed surveys it was found to be rather more widespread than had been thought.For this reason Hygrocybe calyptriformis was not included in the Red List update of 2006. Nevertheless, this is still a rare waxcap: until 2007 the Pink Waxcap was a UK Biodiversity Action Plan (BAP) species. 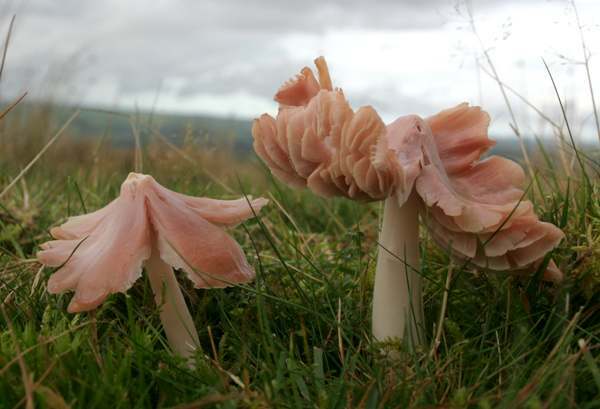 Some authorities list the Pink Waxcap as edible, but as these wild grassland fungi are still so scarce it would be quite unforgivable to gather them for eating.